DayNa Decker is both innovative and trendsetting while creating eco-friendly yet stylish products. A powerful combination of skills and design. She invented the Luminesse Sculpture (shown above) that uses 100% pure plant derived fragranced lamp oil - a first of its kind. She also uses an EcoWood Wick in her chandel that burns clean and creates a soothing crackling sound as it burns. 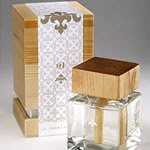 Diffusers have been a major trend in the home fragrance industry over the last few years. 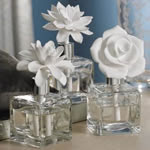 They typically use a decorative vase filled with fragrance oil and bamboo reeds to absorb and diffuse the scent creating a constant fragrance. Some diffusers use ceramic pieces or wood block for diffusion. Other options for constant fragrance are ceramic potpourri or scented rocks. Post your answer below for a chance to win a 6oz DayNa Decker Clementine Chandel. We'll select a winner on Friday, April 15th. We'll ship the winning candle to any continental US address. Good luck! 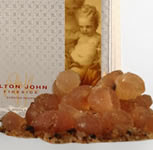 How about a decorative sculpture or nic nac that is made of a material like the scented rocks? Decorative scented tissue box covers!! Perfect for the bathroom. Scented nightlights! Small enough to be subtle. But not the chessy plastic ugly ones. Beautiful glass ones. Scented decorative tabs to go on the ends of ceiling fan blades. They could color coordinate or blend to be invisible and would gently release fragrance as the fan blades went 'round. A spray for light bulbs or fixtures and the back sides of curtains that would be triggered by the warmth of a light bulb or sunlight. It would be fabric friendly and would not mess up the light fixtures. Aahhh to dream. A diffuser for the top of lightbulbs that perfumes the air as you read ! A relaxing fountain or some type of tabletop water feature that produced a nice aroma. I love Ashley S' idea of a scented calender -- that would be great and I second it!! but i'd also like something that would scent the exhaust fan in the kitchen for afterward when we cook yummy but smelly foods... ty for the chance! Wind chimes made from strips (maybe 1" wide and of varying lengths) of unglazed pottery or terra cotta which have been either sprinkled with straight fragrance/essential oils or saturated with diluted oils, (e.g., reed-diffuser refill oils) and hung inside an open window. Multi-sensory (sound, scent, sight) input. Congratulations Joanie in Colorado! You won a 6oz DayNa Decker Clementine candle. Please email your mailing address to YeahMe@CandlesOffMain.com to claim your prize.